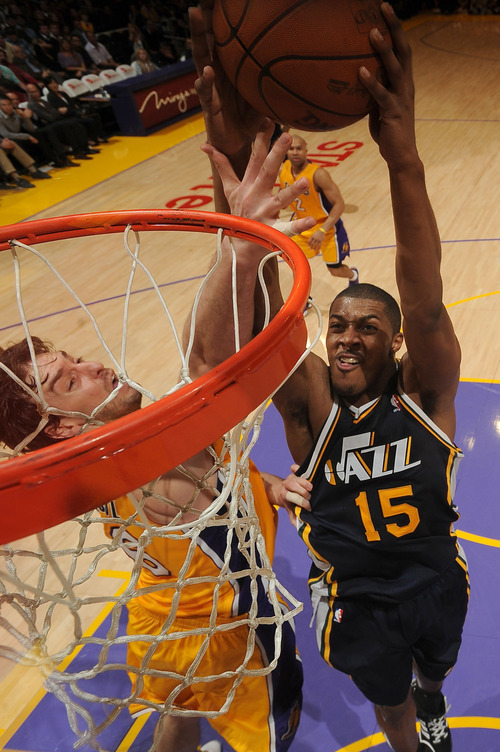 Jazz power forward has improved every facet of his game during lockout. Just before the NBA locked its doors July 1, the Jazz made a last-minute trip to Atlanta to check in on a special assignment. 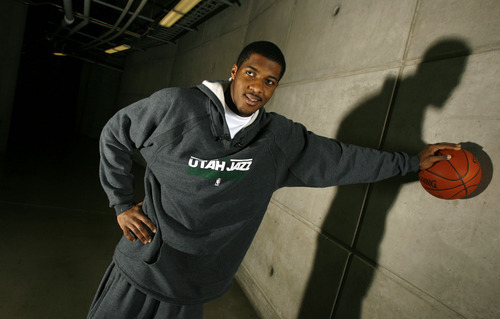 Utah power forward Derrick Favors did all the right things toward the end of the 2010-11 season, averaging 9.6 points and 6.7 rebounds during April as he began to deliver on the promise of being the No. 3 overall pick in the 2010 NBA Draft. The Atlanta native also said all the right things during his April 14 exit interview, assuring Utah coach Tyrone Corbin and general manager Kevin O' Connor that no matter how long the league's work stoppage dragged on, he'd be primed and ready to go as soon as he received a call informing him that it was safe to return to the professional game that he was just beginning to feel comfortable playing. But the Jazz wanted a little extra assurance. Utah rookie center Enes Kanter was heading to EuroBasket in Lithuania, while future Jazz teammates Gordon Hayward and Alec Burks were about to team up for workouts in Indianapolis. Favors was going solo. His unique blend of power and speed has the potential to dramatically alter Utah's future. But he was just 19 years old when the lockout began, only had one season of college ball under his belt and had spent most of his NBA rookie campaign balancing the pressure of being an unproven lottery pick with the frustration of having his name tied to Carmelo Anthony every time a new New Jersey trade rumor surfaced. So the Jazz took a trip to Atlanta. Representatives for the organization met with Favors, checked in with his agent, Wallace Prather, and checked out former NBA player Dion Glover, who'd worked out Favors during 2010 pre-draft training sessions and would primarily be responsible for improving his strength and conditioning as long as the lockout lasted. The Jazz left Favors' hometown convinced that a major key to their rebuilding project was not going to let them down. Three months into the NBA's labor war, all indications are that Favors has kept his word. "He's in the best shape I've ever seen him in," said Glover, who spent six seasons in the NBA, including a 1999-2004 run with the Hawks, and starred at Georgia Tech. "I think Derrick's going to have a great year if they do decide to play." He added: "You can tell the difference in the shoulders. He has those Dwight Howard-type shoulders." The muscle should only continue to build. Last week Favors traded Atlanta for Santa Barbara, Calif., joining Jazz center Al Jefferson at Peak Performance Project (P3). Utah has increasingly relied upon P3 to provide state-of-the-art training for its athletes, and the Jazz have a quasi-secret weapon in the facility as the work stoppage enters its 12th week. Corbin and O'Connor aren't allowed to contact Favors or even mention his name while the lockout is in place. But Utah trusts the P3 staff, and Jazz players can drop in and visit the California coast whenever they get the urge to fly west. 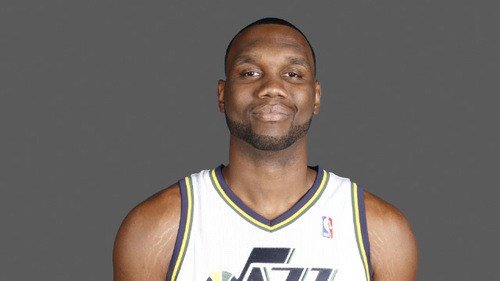 Prior to his P3 excursion, Favors sounded more confident and at ease than he did at any point after joining the Jazz on Feb. 23, following a blockbuster trade that shipped Deron Williams to New Jersey and brought Devin Harris and the 2010 No. 3 pick to Salt Lake City. After the season ended, Favors spent a couple weeks relaxing and clearing his mind. Then he hit the gym with Glover, putting in work Monday through Friday. "You grow up playing basketball your whole life and just being around it every day," Favors said. "When you have all the free time, you don't know what to do with yourself." His routine consisted of two-mile runs on a treadmill before each training session. Then he spent about an hour and 15 minutes alternating weight lifting with leg work, depending upon the day of the week. Regular pickup games followed, highlighted by appearances from Atlanta area regulars such as Jarrett Jack (New Orleans) and Louis Williams (Philadelphia). Favors even matched up against the muscle-armed Howard during a pro-am game. While many NBA players joined informal lockout leagues and some took their talents overseas this summer, Prather intentionally kept Favors at home. He surrounded the impressionable 20-year-old with positive people that can provide invaluable experience, displaying the intangibles that often separate pro lifers from disappointing burnouts. "He's busting his hump. 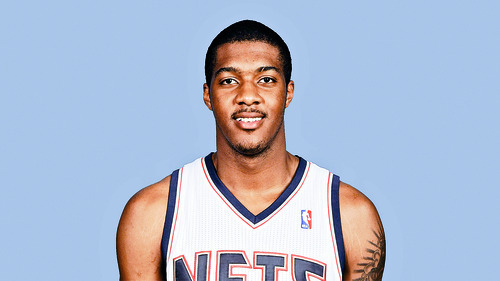 No question," said Prather, who stated that playing overseas is not a priority for his client. Prather added: "He has to improve at all facets and that's exactly what he's attempting to do." Everything from orchestrated post moves and an extended mid-range game to running the floor have been on Favors' agenda. As has been the understanding that the former Yellow Jackets standout will face heightened expectations whenever he puts on a Jazz uniform again. Playing time and rotations spots are up for grabs under Corbin's leadership, and Favors could be called upon to average starter's minutes and be on the floor for an entire 82-game season if the 2011-12 NBA calendar begins on time. As a result, Glover has consistently tested Favors, fulfilling the player's desire to add more muscle weight while insisting that Favors begin each session by running instead of shooting or lifting. Three months into a lockout with no immediate end in sight, the man that the Jazz entrusted to push their young project to the limit is confident in his work. Glover made a living in the league and knows what it takes to survive in the NBA. Now, he's trying to turn Favors into a perennial All-Star. "I haven't found his wall yet, and that's the scary thing," Glover said. He always been very mature from the day I met him, and very professional about getting his work in and taking care of business. He's actually a student of the game, which surprised me a lot." Favors recently teamed up with Jazz forward Al Jefferson to train at Peak Performance Project in Santa Barbara, Calif., during the NBA lockout. Favors' home base is Atlanta, though, and he will likely return there to continue his offseason training.